This week’s installment in The Many Faces of Gunma-chan reminds me of a Rorschach test. Though there is an actual interpretation and meaning behind this visual salad of an image, I think that the possibilities are potentially endless! Personally, it appears to me that Gunma-chan is vomiting his internal organs onto a field of cabbages. Like cows with their many stomachs, ponies apparently have many hearts, and poor Gunma-chan is expelling his all over the unsuspecting foliage. かわいそうね! What do you think Gunma-chan is up to in Tsumagoi? I’ll post the actual meaning tomorrow! Below the cut!Gunma-chan is participating the the local Tsumagoi tradition, whereby one declares one’s love for one’s wife loudly in the middle of a field of cabbages. Apparently it’s the thing to do in Tsumagoi! This entry was posted in Gunma and tagged ぐんまちゃん, cabbage, cute, 群馬、, Gunma, Gunma chan, hearts, Tsumagoi, 嬬恋. Bookmark the permalink. He appears to be proclaiming his love to something from the middle of the cabbage field. Wish I could figure out that one kanji. Ooh, that’s pretty close, actually! 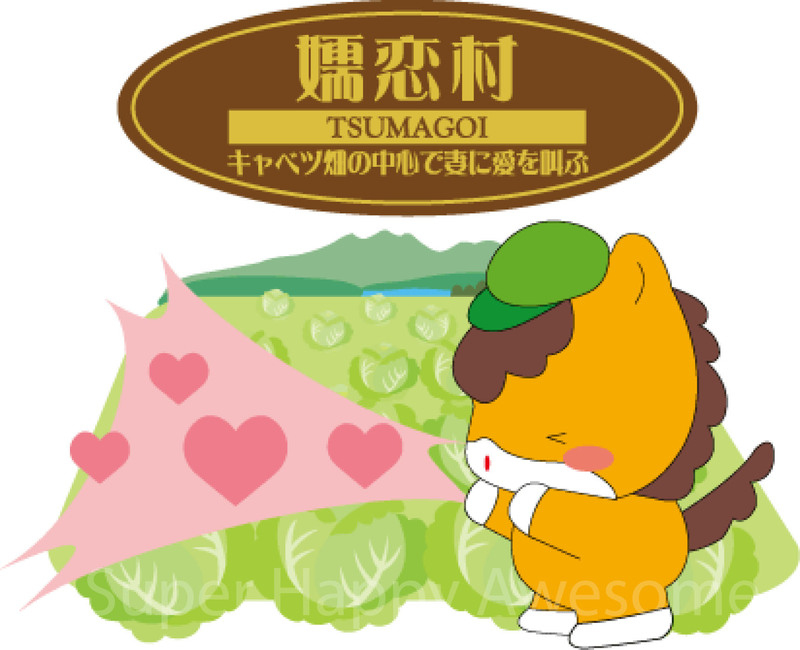 Gunma-chan has seasonal allergies in the middle of the cabbage field, and of course when magical ponies sneeze they sneeze out cute little hearts! Hahaha, excellent! His sneezes are made of love! He’s shouting his love to his wife from the middle of a cabbage field. (Later he’s going to bring a bouquet of cabbage leaves to his wife as this is considered romantic in Gunma, apparently). Well done, sir! Though I suppose your answer is based more on “reading the kanji” as opposed to a creative interpretation? ばれた！ごめんね。Not sure what I would have made of it if I’d just had the picture, though the name of the village is also a bit of a clue.